Pengotan is a village of around 3,800 on the southern side of Bali’s Mount Batur. Walk into a house here in Pengotan and chances are someone will be weaving bamboo to be used in offerings. Much of the law of the land is informed by customary tradition, the perarem, handed down from previous generations. PENGOTAN, Indonesia — Hundreds of top-heavy bamboo stalks stretch up from the ground and lean under their own weight over a road in Pengotan, a village on the island of Bali. Heavier evergreens stand out further back around small settlements. Signposts remind residents and visitors to observe a ban on hunting. I run into Wayan Kopok, the head of Pengotan’s customary council, at the office of the local credit union. He takes me through the perarem, or customary rules, covering forest conservation in this traditional Balinese community. Mains water access is unavailable due to a lack of piping, but the community in Pengotan has bored wells and trapped water in a small reservoir. The economy here is driven by agriculture, both arable and livestock, which accounts for much of the local water consumption on an island where water can be scarce. Pengotan is a village of around 3,800 on the southern side of Mount Batur. At sunrise the village sits in the shadow of Mount Agung, another active volcano, whose slopes rise eastward from the village. The Besakih temple, Bali’s holiest Hindu site, is a short drive away by motorbike. Walk into a house here in Pengotan and chances are someone will be weaving bamboo to be used in offerings. Chicken coops, household baskets, ceremonial items and more are all fashioned from the fast-growing evergreen. Other well-known sites, such as the nearby Eka Karya Botanical Gardens in Bedugul, offer a more thorough background on bamboo, which is becoming increasingly prominent in construction and in conservation in rural communities across the world’s largest archipelagic country. An information board details how Thomas Edison invented the first incandescent light bulb using a bamboo filament in 1883. 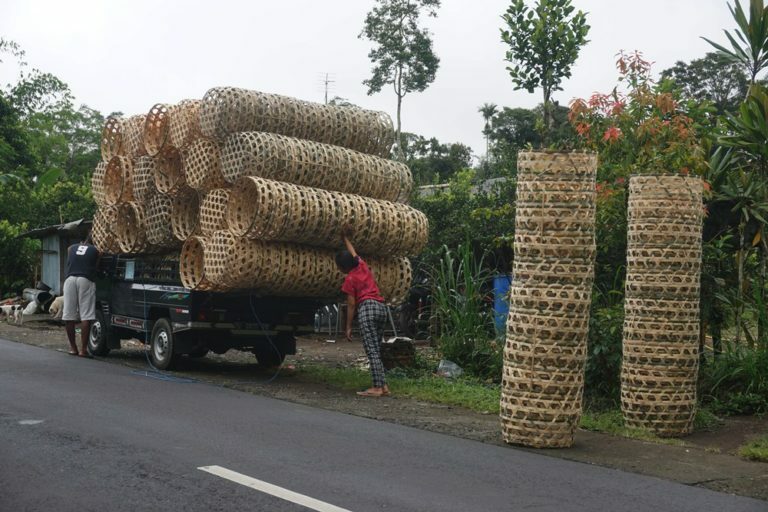 Bamboo products are loaded onto a truck in Pengotan. Image by Luh De Suriyani for Mongabay. Wayan Suardana, the village headman, says more needs to be done to boost the community’s economic welfare. Of 1,015 registered households, some 260 are classed as living below the poverty line. But local leaders also recognize the need to protect the integrity of the land they have called home for generations. New Year for the Balinese culminates in Nyepi, a day of fasting, meditation and silence, in which movement is restricted for 24 hours. It marks a break in human activity, during which much of the island becomes a ghost town for a day and a night. In Pengotan it is forbidden to cut down any trees for 11 days during the New Year celebration. Much of the law of the land is informed by customary tradition, the perarem, handed down from previous generations. Cut down one tree and you must replant five in its place. In the rainy season, any replanting is carried out with a greater sense of urgency due to the innate risks of landslips after a downpour. 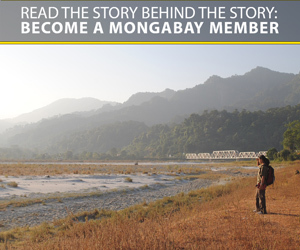 Residents who manage land have to pay a fee to the community, known as an ayahan. Using half a hectare (1.2 acres) of land, for example, incurs a charge of 1 million rupiah ($71). Sugar palms are prohibited. The gangly trees shoot up and spread a wide parasol, blocking sunlight to the rest of the ecosystem below. Fifteen minutes away, a sign in the neighboring village of Penglipuran says 14 species of bamboo are under management in the forest, including a type used to make ropes for use in construction. Data on forests in Indonesia is notoriously threadbare, and there’s no register of land and tree cover in Pengotan, Suardana says. Pengotan features several houses built in the traditional style, where the roofing and load-bearing walls use bamboo. But with cement and modern construction techniques easier than ever to access, these structures aren’t as common as they once were. Kopok says the customary rules that govern the community’s stewardship of the environment remain an oral tradition, passed on only during village gatherings. Banner: A bamboo forest in the part of Bali where Pengotan is located. Image by Luh De Suriyani for Mongabay.